Two options are being given for the proposed Connaught replacement design. 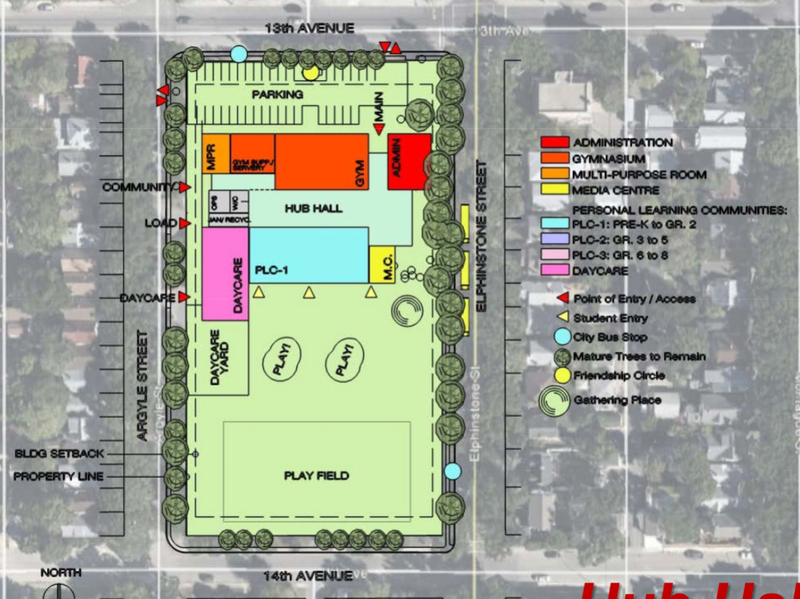 Both involve a parking lot fronting 13th Avenue, and quite a bit more building sprawl with less green space, as expected. The square footage will be approx. the same as the old building, but a lower and wider footprint. There is no 3rd storey, and the design group is apparently adamant that there will be no basement (not much help in a tornado or plough wind!). The drawing follows the concept of three larger ‘personal learning community’ spaces for grouped grades. These may be separated by the garage doors that go with such designs. It is unclear how the dual track French-English is dealt with in the drawings. A request for a performance stage was turned down, as the government considers performance stages wasted space, and will not fund them. It’s hard to tell from the drawings, but there doesn’t look to be much set-back on Elphinstone and Argyle. It looks like city elms surrounding the schools will be retained, but there will be some loss of the remaining group of mature elms that were in the school’s front yard (compare photo to design proposal below). 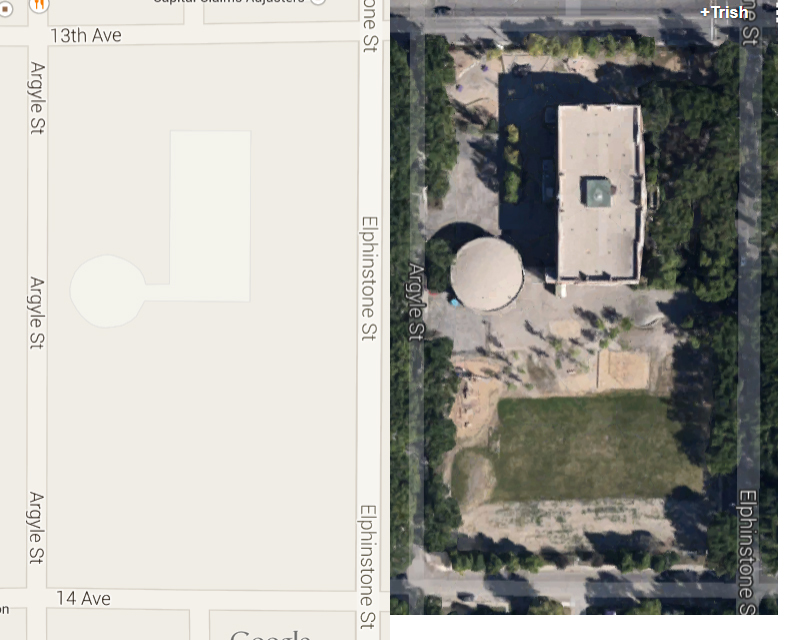 The proposed parking lot space is shown as green in the drawing, but we can assume it will be not be that colour. This area was formerly a naturally landscaped playground (trees, rocks, native plant garden) with a Friendship Circle sculpture and play structures. The Friendship Circle, designed as a contemplative sitting area for children, will be surrounded by parking lot. With the Neighbourhood Confectionary, there will now be two parking lots facing kitty-korner on an entranceway to the neighbourhood. It is disappointing that they didn’t come up with a more compact, small footprint design suitable to an urban older neighbourhood, and that they didn’t hear comments gathered in the first survey about green setback and keeping parking lots off 13th, which is a feature character-defining street for the neighbourhood. However it is not surprising, as the proposal follows the standard design parametres of the province’s new schools, rather than local community standards.